This is the fifth album by Polish (of Greek origins) guitarist / drummer / composer Apostolis Anthimos, mostly familiar as the lead guitarist of the legendary Polish power trio SBB, but also active in other music fields, as this album's title perhaps suggests. 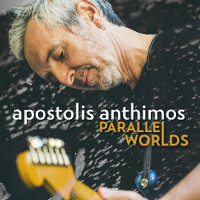 On this album Anthimos plays guitar and drums and is accompanied by bassist Robert Szewczuga, keyboardist Piotr Matusik and saxophonist Olaf Węgier. A couple of vocalists appear as guests on one track each. The album presents fourteen original compositions, presumably all by Anthimos, since nothing is explicitly stated on the album's artwork. The music is quite different from what Anthimos is usually associated with, presenting mostly melodic Jazz, some Fusion and World Music, all very delicate and subdued. The focus of this album is fully directed on Anthimos the composer, especially in view of the fact that his guitar playing here is limited, and he plays drums on all tracks instead. The guitar is prominently featured mostly on the title track and sparingly on a few other tracks, which again points out, that the concept was to show a different facet of Anthimos' Music. His fully blossomed composing skills result in a superb collection of wonderful melodies, all of which are skillfully weaved and harmonically coherent. The performances are all excellent and with the absence of Anthimos' guitar, the soloing is mostly the responsibility of Matusik and Węgier, both of whom show exceptional skills and taste. Szewczuga lays exquisite layers of bass statements, which round up the sound of the quartet and Anthimos drives the rhythmic pulsations flawlessly. Overall this is a wonderful melodic, mostly Jazz album, with excellent compositions and outstanding performances, which should keep every Jazz connoisseur extremely happy. People used to Anthimos' Rock and Fusion explorations might be surprised to hear this album but if they have any taste and music understanding they should accept this simply as another facet of their idol's musical personality! Lakis ευχαριστώ for this great music!